Just over three years ago, Brian and DeDe Coleman made their dream a reality. They opened the doors to Midvale’s very own 2 Row Brewing. Around that time, the local craft beer scene was pretty well set in place with a handful of usual suspects littered throughout the state. Utah was a little slower to catch the craft beer wave, so we were overdue for something refreshing and new to drink. When the Colemans launched in June of 2015, they brought not only the hops but the charge for a slew of new breweries to come in the following years. Brian loves hoppy beers and, as head brewer, almost immediately rose to the top of the IPA food chain with classics like Random Double IPA, Accelerator IPA and crowd favorite Tastes Like Citrus. The latter brew has the honor of being one of the neighborhood’s first local New England Style IPAs. Once other breweries realized the importance of this now official style of beer, it was just a matter of time before everyone was Chasing Haze. Upon drinking, we gently rolled the bottle in our hands in an effort to distribute the haziness evenly before dispensing the goodness. We cracked the top and proceeded to pour the goldenrod-colored beer into our trusty tulip-stem glass. As the liquid fills the cup, minimal froth makes an appearance, leaving only a permanent halo clutching the rim. A popular characteristic of this style is the amount of purely electric aroma from the hop bill, and Chasing Haze does not lack in this area. The hop bill consists of Citra, El Dorado and Mosaic, thus creating a tropical, citrusy smell. Lifting the cold beer to our lips, we both took different approaches. One of us took a slight sip and the other welcomed the liquid with a refreshing mouthful, which is much more fitting on a warm day. Chasing Haze doesn’t disappoint in the flavor department—another well-liked trait of the style is the citrus’ sleek mouthfeel and low bitterness. Having learned all about NEIPAs, Brian is happy that this beer comes in at a 6.5 percent ABV. Based on his experience, it is the perfect alcohol content for this style. 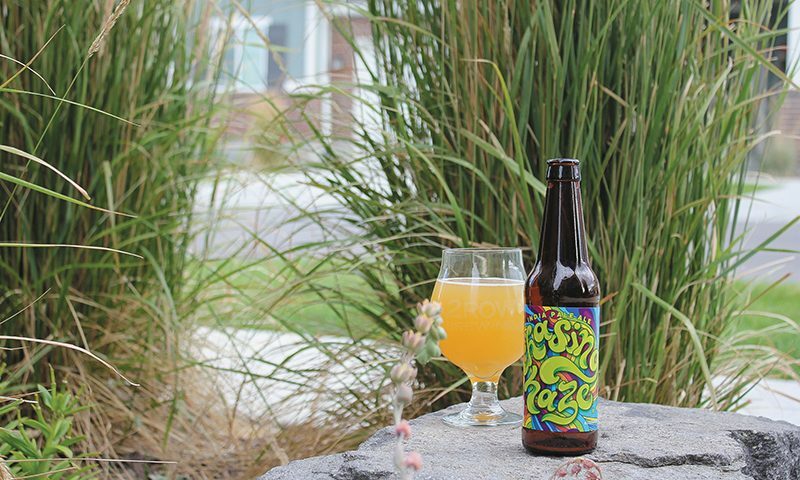 Chasing Haze is the latest NEIPA to make the cut for the brewery’s regular rotation. Adorned with a groovy label, it fits in perfectly with the rest of the 2 Row staples. We asked Brian if it was a blessing or a curse to be considered one of Utah’s premier stops for hoppy beer, and he replied, “Absolutely a blessing. We love making IPAs, and of course, every brewery wants to have a reputation for making something extraordinary.” Many of the local breweries have jumped on the haze train at some point, making it great for all of us who enjoy this refreshing approach. 2 Row Brewing was one of the first to see the haze at the end of the tunnel, giving hopheads what they crave so badly. 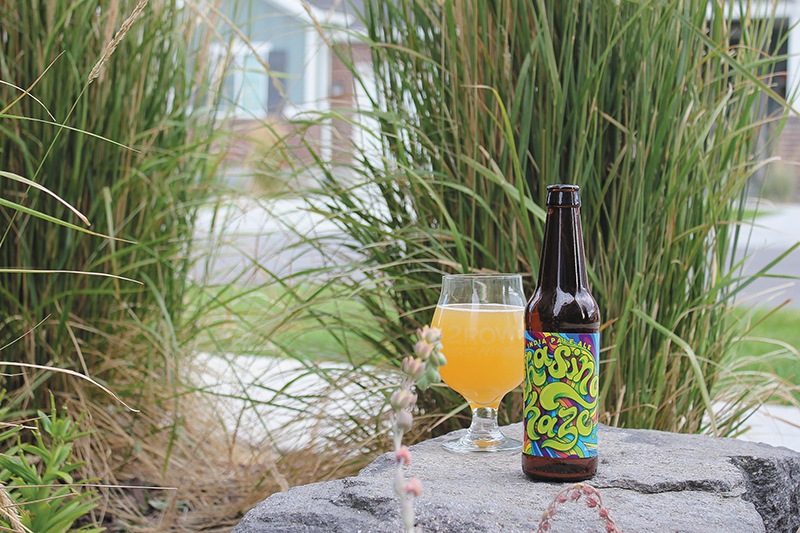 Brian says that this is the first beer he brewed using a “secret sauce” method, which he plans to employ in upcoming releases of Feeling Hazy and Tastes Like Citrus. We appreciate Brian’s creativity and his vision for the future of craft beer. It helps break down barriers for new breweries in our state, as well as bring one of the beer industry’s most popular trends to the masses.